Hiya! 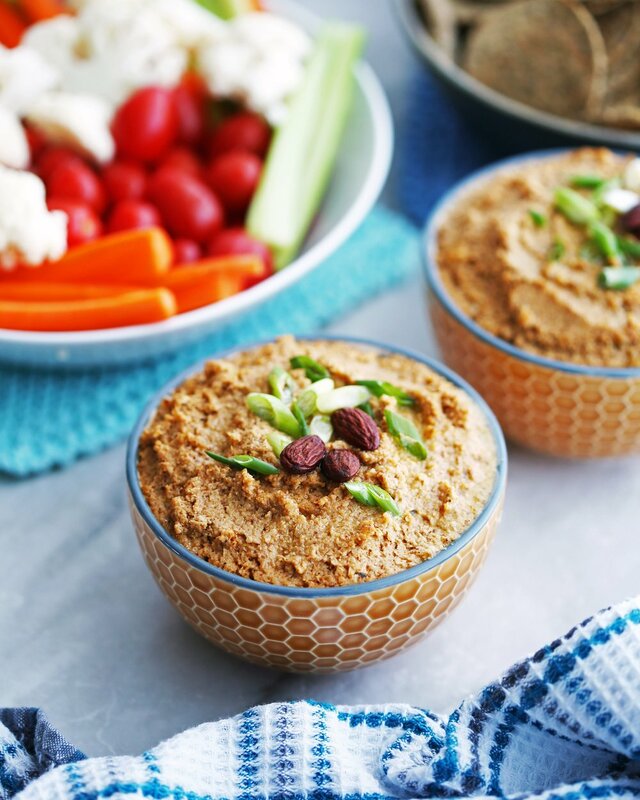 I’m back with a delish, savoury Spicy Roasted Cauliflower Garlic Dip! Roasting the cauliflower at a high temperature with select herbs (like pungent oregano and citrusy ground coriander) and spices (like spicy chili powder, cumin, cinnamon, and black pepper) along with a good amount of whole garlic cloves, then mixing it up with some other flavourful ingredients creates one delectable dip! The scrumptious seasoned roasted cauliflower is tender, browned, and slightly charred from the oven. The garlic, which I wrapped in aluminum foil and placed on the baking sheet with the cauliflower, is soften, browned, and results in a sweeter and milder garlic flavour. I like to add between four to six garlic cloves depending on the size of the clove and how garlicky I want the dip to be. Roasted almonds: It adds toasted nuttiness and slight crunchy texture. I used tamari seasoned roasted almonds, but regular roasted almonds work just as well. Tahini: Roasted ground sesame seeds that’s makes the dip creamier. Lemon juice: Citrus flavours gives the dip a fresh and bright note and cuts down the heat slightly. More extra virgin olive oil: It’s distinct in flavour and used to thin out the otherwise thick dip. More salt and pepper: Compliments and enhances the flavour of other ingredients. Once you pulse the ingredients all together (the texture is like a thick hummus), taste and adjust to suit your flavour and texture preferences. I like to buy a whole cauliflower (as opposed to pre-packaged florets) for this recipe. Look for creamy white, tightly compacted clusters of florets, free of blemishes or grey spots. To prepare the cauliflower for roasting, remove the green leaves at its base (save them for homemade vegetable stock or for the compost), chop off the florets and stems, then break them apart with your hands or with a knife into small pieces. This dip has a mild-medium heat (to me). A light warming heat that goes away quickly, but definitely there. Note that I used a regular (mild) chili powder for this recipe. Once, I bought a chili powder labelled as hot (chili powder), dumped a lot into a chili, and it burned like a thousand infernos! (Okay, not quite). Even my husband, who is a big fan of spicy food, couldn't handle the hot chili powder. What I’m saying is that this recipe is adaptable in terms of spiciness so go with a level of heat that you are comfortable with. You can always lightly spice the cauliflower at first, make the dip, then taste and adjust for more spice at the end if you like. I like to serve this dip at room temperature with sliced vegetables (crudités), tortilla chips, crackers, and/or pita bread! You can also use it as a condiment or spread for your sandwiches and wraps. Another dip that would go well with those assortment of foods is my recipe for Creamy Roasted Jalapeno Cilantro Hummus. Easy to prepare and ready in 35 minutes or less. Adaptable: you control the spice levels and garlic amounts. Scalable: easy to make more more or less. 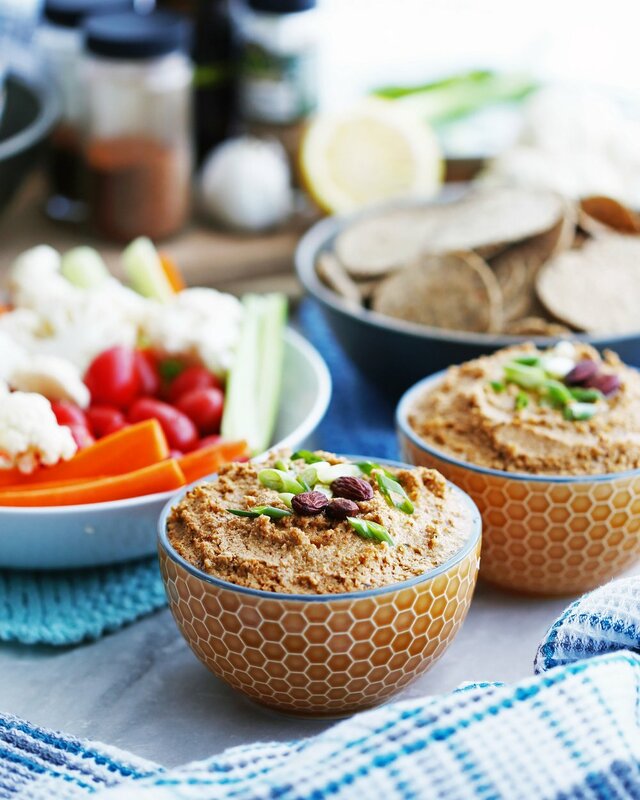 A healthier alternative to other cream-based or cheese-based dips. 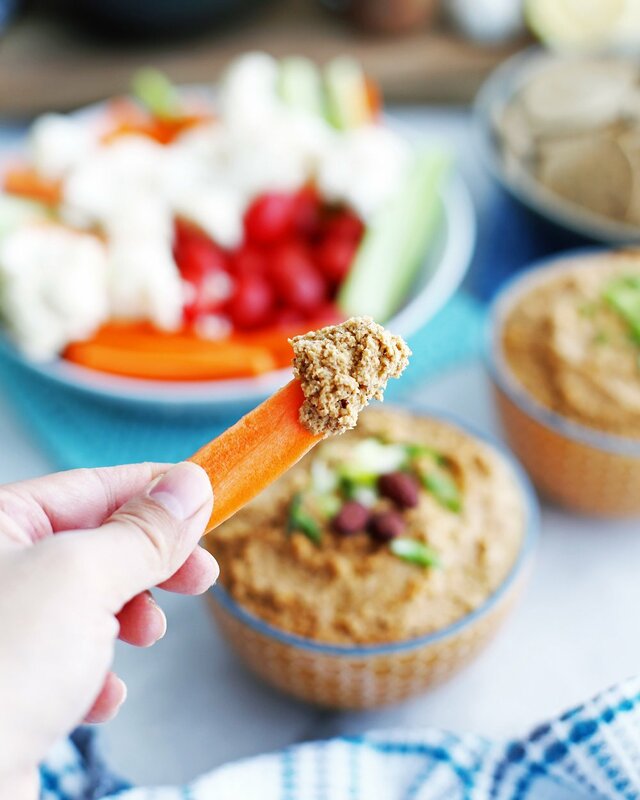 Overall, this dip is delicious, easy to make, and produces about three cups of creamy, thick dip, which is perfect to serve to a crowd or snack on throughout the week. I hope you enjoy this recipe! If you try this recipe, please let me what you think by leaving me a comment and rating below or by tagging me on any of my social media (I love pictures of food!). For the roasted cauliflower and garlic. Preheat the oven to 450 degrees F. In a large bowl, toss the cauliflower with the olive oil and seasonings until the cauliflower is well coated. Wrap the garlic cloves together with a little drizzle of olive oil in aluminum foil. Place the cauliflower on a baking sheet (lined with aluminum foil for easy clean-up) in a single layer. Place the wrapped garlic cloves on the baking sheet as well. Roast for 20-25 minutes, flipping the cauliflower halfway, until lightly browned and tender. For the dip. Place the roasted cauliflower and garlic (aluminum foil removed), along with the almonds, olive oil, tahini, lemon juice, and a sprinkle of salt and pepper in a food processor fitted with an s-blade. Pulse until well-combined, scraping down the sides if needed. Taste and adjust flavours to your own preferences such as adding more seasoning or olive oil. Best served at room temperature with sliced vegetables (crudités), tortilla chips, crackers, and/or pita bread. *Go with a level of heat that you are comfortable with. This dip has mild to medium heat. You can always lightly spice the cauliflower at first, make the dip, then taste and adjust for more spice at the end if you like. Store this dip in an airtight container in the refrigerator for up to one week. Makes about 3 cups. Nutritional calories represents one serving for a total of twelve servings.